Posters were important when I was growing up. I hope they still are for today's kids. We are gradually building up a good collection of educational (eg science) posters over in our kids collection. There wasn't the large supply of commercial artwork promoting brands like today, but there were other rich sources for cheap posters for kids in pre-Rogernomics NZ. Talented kiwi designers found themselves a niche churning out resources for the government departments that ran so many parts of the economy back in those days. In Nelson we had the entomology division of the DSIR (the Department of Scientific and Industrial Research) based at the Cawthron Insitute and both they and the Forest Service had many posters available for education use. You would just go to the front counter and ask what they had. There were posters for Conservation Week each year, including the classic 1981 "Nature's Place in Town" pictured at left. There were also updates to 1930s era vintage posters for the photographic age that show the enduring themes from how NZ was marketed abroad. 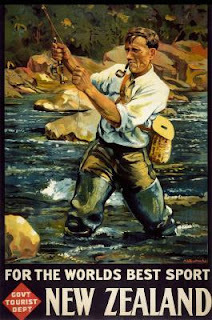 See the Maurice Poulton design "New Zealand: For the World's Best Sport" modernised to the photographically based "New Zealand: The Angler's Paradise" but retaining the same message and content. Posters for women's lib (Girls can do Anything!) adorned the classroom, but not this blog as Crown copyright holds sway over the image still! For older teens the arthouse cinema at the Bishop Suter Art Gallery was a happy hunting ground for movie posters, and we haunted the local record shops for music posters. These were reproductions of touring posters and posters promoting the band.